Growing up, my siblings and I didn’t have easy access to a television. As a result, our indoor entertainment usually came from playing with toys, engaging in games with each other or just sitting alone and reading a book. Looking at the pictures and reading through our newly purchased set of World Book encyclopedias. By the time I was 13 years old, I had gone through that whole set from A-Z multiple times. These fond memories were awakened this past week while watching the evening news. 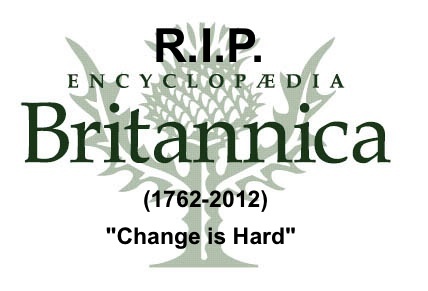 One of the noteworthy topics of news, that evening, was a report that Encyclopaedia Britannica would no longer publish any more print sets. After 250 years and over 7 million sets sold they are now going to focus on their digital and online offerings. After the news report cut to commercial I was a bit emotional. I’m still not sure…maybe you all can help me make my final decision. Nonetheless this experience reminded me of the emotional reality of change. I’m sure it is good financially, for Encyclopaedia Britannica to make this business decision. I really do understand the rationale. However, despite my rational understanding, emotionally it’s just not cool! As a customer I should be able to special order a print set of encyclopedias 10 years from now if I want too…right? Some of you have been there already…and if not you, we all have an uncle that is still disgruntled about the fact that cassette’s replaced 8-track tapes. Somebody out there is still coping with how the compact disc destroyed the cassette….and many of you still drive around with CD’s in your car even though it has MP3 capability. Even when it makes life easier…change is hard! We cope…we evolve…we change…and that’s what makes us all so innovative and resilient! As for me…I am still processing this recent news of change…so to mark this change I will post a memorial next week, to our deceased habits, gadgets and wares that have not survived our accelerating technological advancement. So, when I saw the title of this post, my first thought was “No kidding! !” Actually, my first thought was something else – but it’s not polite to cuss in a public forum. 😉 All joking aside – thank you for this perspective. I’ve usually an early adopter of change when it relates to technology because of my love of gadgets. But, when it’s organizational change or a personal change – I’m a bit slower to accept it. This inspires me to challenge myself a bit to change my perspective. Can’t wait for part 2! 1) Love EB. I did the same in my youth, exploring different worlds a letter at a time. Truly RIP. 2) hot wheels parking garage…traffic jam!